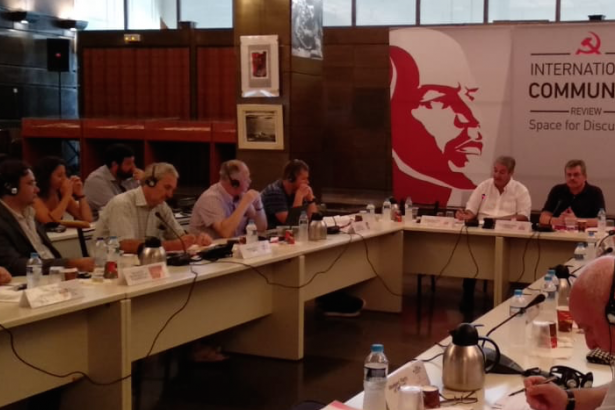 As part of the preperations for the 9th issue of the INternational Communisr Review (ICR) the editorial board meeting was held on 21 and 22 Spetember in Athens. At the meeting the representatives of the parties which will be contributing to the 9th issue ,the Workers Party of Ireland, Communist Party (Italy), Socialist Movement of Kazakhstan, New Communist Party of Yugoslavia, were represented as well as the representatives of the founding members parties, Communist Party of Venezuela, Communist Party of Greece, Socialist Party of Latvia, Communist Party of Mexico, Communist Party of the Peoples of Spain, Communist Party of Turkey, Russian Communist Workers Party. The participants of the meeting discussed the articles of the 9th issue on the Labor and Trade Union Movement and the work of the communists in it. The 9th issue of the ICR will be published in 2019. Besides the editorial board meeting, the representatives of the parties, on the occasion of their presence in Greece, attended the events of the Festival dedicated to the 100 years of the KKE - 50 years of KNE.